This course will condense decades of information about instructional research into clear plans of action. The authors identify nine categories of instructional strategies that can maximize student learning and explain the vital details needed to know about them. 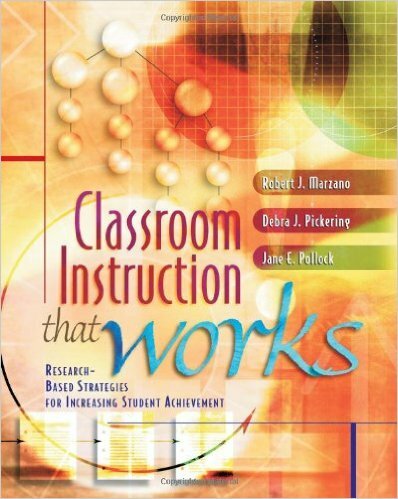 This book examines data that explains the teaching strategies that can help raise student comprehension. Educators will analyze data on researched-based instructional strategies that work to implement in their instruction for increasing student achievement. Educators will read about applying the research on instructional strategies into their lessons and how to teach specific types of knowledge in school settings. Participants will review the research identifying similarities and differences, summarizing and note-taking as well as reinforcing effort and providing recognition to students. Educators will read what the research reveals about homework practice and how cooperative learning can be limiting as well as effective. Participants will work on setting objectives and providing feedback, generating and t testing instructional hypotheses, working on advanced organizers, cues and questions. Educators will learn about teaching specific types of knowledge and using the nine categories in their instructional planning and classroom applications.